Completes numerous peacetime voyages for her owners to North Sakhalin, Borneo and Los Angeles. Kobe. Undergoes conversion to a Naval Auxiliary Tanker at Kawasaki Heavy Industries shipyard. Registered in the Kure Naval District as a auxiliary transport (oil supply), (Ko) Category under internal order No. 1093. Captain Ueda Hironosuke (42) is appointed Supervisor of NIPPON MARU. Departs Saeki. Seven oilers are assigned to the Hawaii Operation, but the IJN’s practical experience in refueling at sea is almost nil. Earlier in the month, three refueling exercises were held in Sukumo Bay and the Ariake Sea. That same day, NIPPON MARU refuels destroyer AKIGUMO and other destroyers for training purposes. While enroute to the Kuriles, all units in the carrier formation are refueled ten times. Etorofu Island, Kuriles. NIPPON MARU departs Hitokappu Bay with Captain (Rear Admiral posthumously) Niimi Kazutaka's (40) (former CO of light cruiser TAMA) Supply Group No. 2's oilers TOHO (F) and TOEI MARUs and Captain Ota Masanao's (39) Supply Group No. 1's oilers KOKUYO, KYOKUTO, KENYO and SHINKOKU MARUs. Provides fuel for Vice Admiral (Admiral, posthumously) Nagumo Chuichi's (36) Carrier Striking Force ("Kido Butai") CarDiv 1's AKAGI, KAGA, CarDiv 2's HIRYU and SORYU, CarDiv 5's SHOKAKU and ZUIKAKU and the Support Force. The Support Force consists of Vice Admiral Mikawa Gunichi's (38) BatDiv 3/1's HIEI and KIRISHIMA, Rear Admiral (later Vice Admiral) Abe Hiroaki's (39) CruDiv 8's TONE, CHIKUMA and Rear Admiral (later Vice Admiral) Omori Sentaro's (41) (former CO of battleship ISE) DesRon 1's light cruiser ABUKUMA and DesDiv 17's ISOKAZE, URAKAZE, TANIKAZE and HAMAKAZE, DesDiv 18's ARARE, KASUMI, KAGERO and SHIRANUHI and CarDiv 5's AKIGUMO and Captain (later Rear Admiral) Konishi Kaname's (44) Midway Bombardment Unit's DesDiv 7's SAZANAMI and USHIO and oiler SHIRIYA. Nagumo's orders from Admiral (Fleet Admiral, posthumously) Yamamoto Isoroku (32), CINC, Combined Fleet, are that if refueling proves impossible in the stormy winter waters of the Northern Pacific, Nagumo is to detach AGAKI, SORYU and HIRYU and his destroyers and make the attack with only KAGA, SHOKAKU and ZUIKAKU that need no refueling. 600 miles N of Oahu, Hawaii. NIPPON MARU provides destroyer AKIGUMO with 10-tons of fuel. At about 1130, after fleet refueling is completed, the 2nd Supply Group's oilers TOHO, NIPPON and TOEI MARUs and destroyer ARARE are detached from the Striking Force and turn towards a designated rendezvous point with the carriers for the retrurn trip to Japan. 400 miles N of Oahu, Hawaii. At 0810, after refueling the Carrier Force, the 1st Supply Group's oilers SHINKOKU, KENYO, KOKUYO and KYOKUTO MARUs and destroyer KASUMI are detached and turn towards a designated rendezvous point with the carriers for the retrurn trip to Japan. The Striking Force increases speed to 24 knots and proceeds to Hawaiian waters to launch the attack. Vice Admiral Nagumo dispatches ABUKUMA and DesDiv 17's TANIKAZE to Supply Group No. 1 at the rendezvous point following final refueling before the attack. At about 2100, the two warships reach the oilers, refuel and return with the oilers to the First Air Fleet. At 0618, the Carrier Striking Force launches attacks that later sink battleships USS ARIZONA (BB-39), USS OKLAHOMA (BB-37) and USS CALIFORNIA (BB-44) and damage USS NEVADA (BB-36), USS PENNSLYVANIA (BB-38), USS TENNESSEE (BB-43), USS MARYLAND (BB-46), USS WEST VIRGINIA (BB-49) and other smaller ships. 2,335 American servicemen die in the attack, most on USS ARIZONA. After recovering all but 29 of its aircraft lost in the attack, the Striking Force departs Hawaiian waters NNW towards Japan. Arrives at the designated rendezvous point located at 30-00N, 165-00E. The 2nd Supply Group's oilers NIPPON, TOHO and TOEI MARUs rendezvous with, and refuel, the Striking Force. That same day, seven destroyers of DesDiv 21 and DesDiv 27 from Tokoyama rendezvous with the 1st Air Fleet to provide additional ASW protection. Arrives at Hashirajima. Departs later and arrives that same day at Kure. Departs Kure. Later joins with tanker SHINKOKU MARU and battleships HIEI and KIRISHIMA and departs Kure area the following day escorted by DesDiv 17 and 18. At 1036 arrives at Truk. Arrives at Tokuyama. Loads fuel oil. At 1630 departs Kure with tanker KENYO MARU (from Hashirajima). At 1630 departs Palau inner harbour. At 0730 due to depart Palau Atoll west channel. Likely off Kanogawa meets with tankers KYOKUTO and KENYO MARUs and proceeds south. Departs Staring Bay with tankers KENYO, KYOKUTO and TOEI MARUs escorted by 27 DesDiv. At 03-46S 97-20E tanker NIPPON MARU transfers 700 tons of fuel oil to battleship KONGO, while tanker KENYO MARU transfers 600 tons to KIRISHIMA and tanker SHINKOKU MARU transfers 599 tons to HIEI. Between 0800 and 1830 in 06-32N 109-38E Staring Bay, tanker KENYO MARU transfers 1500 tons fuel oil to battleship HIEI; tanker KOKUYO MARU from 0800 and 1614 transfers 1045 tons fuel oil to battleship KONGO; tanker NIPPON MARU, from 1503 to 1100 the following day, transfers 1100 tons fuel oil to battleship KIRISHIMA; and tanker KOKUYO MARU, from 1735 to 0300 the following day, transfers 1520 tons fuel oil to battleship HARUNA. Arrives at the Operation "C" refueling point A (09-00S,106-00E). Refuels carrier HIRYU. NIPPON MARU refuels Bat Div 3's KONGO with 700 metric tons of fuel oil. That same day, NIPPON MARU refuels the Striking Force's AKAGI, CarDiv 2, CarDiv 5, BatDiv 3, CruDiv 8, DesRon 1 plus destroyers ARARE, KAGERO, MAIKAZE, HAGIKAZE and AKIGUMO. NIPPON MARU refuels carrier HIRYU. NIPPON MARU refuels BatDiv 3's KIRISHIMA with 1,100 metric tons of fuel oil. Transits the Bungo Straits in a convoy also consisting of tankers SHINKOKU, KOKUYO and TOEI MARUs. Arrives at Kure. Assigned to Supply Group No. 1 for the upcoming Operation “MI” – The Invasion of Midway. Departs Hashirajima with Captain Ota's Supply Group No. 1’s also consisting of oilers KOKUYO MARU, KYOKUTO MARU, KENYO MARU, SHINKOKU MARU escorted by the destroyer AKIGUMO. At 0500 departs Yokosuka in a convoy also consisting of tanker SHINKOKU MARU escorted by destroyer YAMAKAZE and minelayer UKISHIMA bound for Ominato. Later UKISHIMA detaches. At 1130 the tankers arrive at Ominato. Assigned to the Northern Area Naval Forces. At 1840 departs Hashirajima, Hiroshima Bay. Transits the Bungo Straits in a military task force (7th Fleet movement) consisting of heavy cruisers KUMANO and SUZUYA and also consisting of oiler KYOKUTO MARU escorted by destroyers SAMIDARE, OYASHIO, MURASAME, YUDACHI and KUROSHIO. At 1840 arrives in the Singapore Straits. At 2000 NIPPON MARU departs Singapore Straits with heavy cruisers KUMANO and SUZUYA escorted by destroyers OYASHIO, HAYASHIO, YUDACHI, MURASAME and SAMIDARE. At 1640 arrives at Mergui. From 0855 to 1220 transfers 402 tons heavy fuel oil to heavy cruiser KUMANO. From 1220 to 1500 transfers 410 tons heavy fuel oil to heavy cruiser SUZUYA. From 1540 to 1650 transfers 153 tons fuel oil to destroyer OYASHIO and 140 tons fuel oil to destroyer HAYASHIO. From 1150 to 1315 refuels destroyer KUROSHIO. From 1400 to 1535 transfers 104 tons heavy fuel oil to destroyer HARUSAME. From 1100 to 1220 transfers 176 tons fuel oil to destroyer SAMIDARE. Rear Admiral (later Admiral) Richmond K. Turner's (USNA ’08) Amphibious Task Force 62, covered by Vice Admiral (later Admiral) Frank J. Fletcher’s (USNA ’06) Task Force 61 and Rear Admiral (later Admiral) John S. McCain's (USNA ’06) Task Force 63’s land-based aircraft, lands Maj Gen (later Gen/MOH/Commandant) Alexander A. Vandergrift’s 1st Marine Division on Florida, Tulagi, Gavutu, Tanambogo and Guadalcanal opening the campaign to retake the island. At 1937 departs Mergui, Burma with oiler KYOKUTO MARU, Heavy cruisers KUMANO and SUZUYA, destroyers MURASAME, YUDACHI, HARUSAME, SAMIDARE, OYASHIO, KUROSHIO and HAYASHIO initially then later SHIKINAMI and URANAMI via Macassar, Celebes and Tarakan, Borneo to load oil, then joins the fleet N of the Solomons. Refuels the destroyers SHIKINAMI and URANAMI at sea. Departs Truk to join the fleet with destroyers MINEGUMO and URANAMI. At sea in 02-30N 161-16E refuels cruisers HAGURO and MYOKO. Refuels destroyers HAYASHIO and MAKINAMI. Transits the Bungo Straits heading south. At 1400 NIPPON MARU escorted by destroyer NAGANAMI departs Truk but only proceed as far as the north pass of the Atoll. At 1000 NIPPON MARU and NAGANAMI arrive at north pass. Later NIPPON MARU returns to Truk. At 0810 refuels destroyer KAGERO and repair ship AKASHI. At 1045 refuels destroyer ISONAMI. At 1250 NIPPON MARU and KENYO MARU depart Truk escorted by destroyer SUZUKAZE. At 1305 at sea in 02-08N 158-23E from 1300 oilers KENYO MARU and NIPPON MARU refuel destroyers and cruiser ISUZU until 0330 the following day. Specifically NIPPON MARU refuels destroyers TAKANAMI and INAZUMA. Refuels destroyers from 15 DG and 31 DG from 1140-1700. At 0600 again refuels 5S vessels and destroyers from 15 DG and 31 DG and destroyer SUZUKAZE. At 2330 undertakes more refuelling operations. During the day refuels destroyers KAGERO, INAZUMA, KUROSHIO, HAYASHIO, OYASHIO and ISONAMI and heavy cruiser TAKAO. From 0630 to 0738 transfers 420 tons fuel oil to heavy cruiser ATAGO. At 0749 refuels destroyers from 15 DG. Transits the Bungo Straits in a convoy also consisting of tankers GENYO, KENYO and TOEI MARUs. Arrives at Kure. Transits the Bungo Straits enroute to Kure in a convoy also consisting of tankers GENYO, KENYO and TOEI MARUs. Captain Ueda is relieved as supervisor of NIPPON MARU. Captain Hiratsuka Shiro (40)(former CO of KUMA) is appointed Commanding Officer. At 0900 oilers NIPPON MARU and KENYO MARU escorted by destroyer SUZUKAZE arrive at Truk. At 0600 departs Truk escorted by destroyer SHIGURE. NIPPON MARU departs Truk bound for Balikpapan, escorted by destroyer OYASHIO. After detaching, OYASHIO arrives back at Truk. At 1200 NIPPON MARU departs Truk escorted by destroyer ONAMI. After detaching, at 1300, ONAMI arrives back at Truk. NIPPON MARU and NAMINOUE MARU are met by three unknown auxiliary subchasers off Fukajima and escorted south. At 1730 arrives at Paramushiro. 7 July 1943: Operation “KE” - The Evacuation of Kiska. NIPPON MARU departs Paramushiro, Kuriles with Rear Admiral (later Vice Admiral) Kimura Masatomi's (41) Evacuation Task Force's light cruisers TAMA and ABUKUMA, DesDiv 10's YUGUMO, KAZAGUMO and AKIGUMO, light cruiser KISO, DesRon 9's ASAGUMO and USUGUMO, DesDiv 6's HIBIKI, Guard Unit No. 1's DesDiv 21's WAKABA and HATSUSHIMO, DesDiv 32's NAGANAMI, Guard Unit No. 2 DesDiv 11's SHIMAKAZE, DesDiv 27's SAMIDARE, Supply Force's converted cruiser AWATA MARU and kaikoban KUNASHIRI. At Paramushiro transfers 97 tons of fuel oil to destroyer SAMIDARE. Again refuels destroyer SAMIDARE at Paramushiro. The mission is aborted due to weather. Returns to Paramushiro. NIPPON MARU is supplemented with 1,600-tons of L1 and 3,873-Tons of L2 fuel oil by auxiliary fleet oiler TEIYO MARU. Refuels the Evacuation Task Force on the second run to Kiska. Returns to Paramushiro with destroyer HATSUSHIMO. Departs Paramushiro for Maizuru with destroyers NAGANAMI and HIBIKI. At 0630, arrives at Truk South Channel escorted by WAKAZUKI. Departs Tarakan in a convoy consisting of NIPPON and TOA MARUs escorted by subchaser CH-5. Recalled Captain-Ret Takehara Kuichiro (35) assumes command. Arrives at Truk in a convoy consisting of NIPPON and TOA MARUs. Departs Truk in a convoy consisting of NIPPON and TOA MARUs escorted some of the way (200 Ri) by destroyer SHIMAKAZE. Arrives in convoy at Tarakan. At 0900, departs Tarakan in an unnumbered convoy consisting of the NIPPON and TOA MARUs escorted by destroyer HIBIKI. At about 0122, LtCdr Edward S. Hutchison's (USNA ’26) USS RASHER (SS-269) attacks the convoy. At 1,500 yards, Hutchison fires four torpedoes at TOA MARU in a submerged attack made at 00-34N, 118-59E. Hutchinson is not sure if he gets a hit and claims possible damage. In fact, one torpedo runs deep and passes under TOA MARU without exploding; another hits but is a dud. NIPPON and TOA MARUs proceed to Balikpapan, Borneo arriving at 1700 that day. 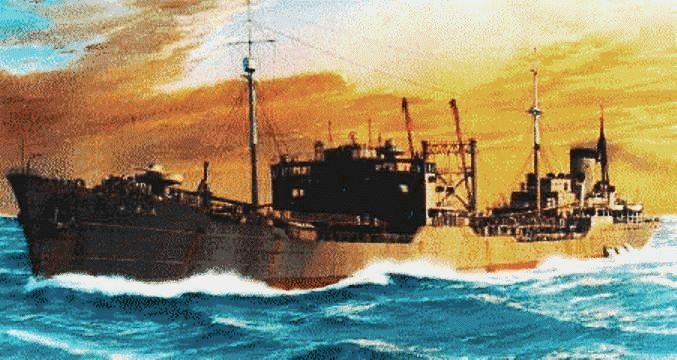 Departs Balikpapan in convoy No.2611 also consisting of tankers SHINSHU, TOA, SHINKOKU and NAMPO MARUs, transport KOYU MARU and one unidentified merchant ship escorted by old destroyer WAKATAKE and auxiliary submarine chaser CHa 37. En route destroyers HIBIKI and HAMAKAZE arrive and NIPPON, TOA, SHINKOKU and NAMPO MARUs all detach and head for Truk. Forces under Vice Admiral (later Admiral) Raymond A. Spruance (USNA ’06) , Commander, Central Pacific, invade Tarawa and Makin Islands. The invasion fleet of 200 ships includes 13 battleships and 11 carriers. At 0530, arrives at Truk. Cruisers SUZUYA, KUMANO and CHOKAI screened by destroyers HATSUZUKI, SUZUTSUKI, HAMAKAZE, FUJINAMI and HAYANAMI departs Truk for the Marshalls in response to the invasion of Tarawa. In a further response to the invasion of Tarawa, NIPPON and TOA MARUs Refueling Group departs Truk for the Marshalls escorted by DesDiv 4’s YAMAGUMO, MAIKAZE and NOWAKI and DesDiv 10's AKIGUMO. At 1231, N of Ponape, LtCdr (later Captain) Melvin H. Dry's (USNA ’34) SEARAVEN (SS-196) torpedoes and sinks TOA MARU. 15 crewmen and three gunners are KIA. AKIGUMO rescues survivors, then returns to Truk. Marshall Islands. Alerted by an "Ultra" signal, in a submerged attack at about noon, LtCdr (later Rear Admiral) Robert H. Rice (USNA ’27) in USS PADDLE (SS-263) fires five torpedoes at NIPPON MARU at 11-30N, 162-15E. Rice and his crew hear and claim two hits, but they are most probably duds. Captain Takehara reports NIPPON MARU sustained no damage in the attack. During the day at sea 325 tons heavy fuel is transferred to heavy cruiser CHIKUMA. Departs Kwajalein with destroyers MAIKAZE and NOWAKI as escorts. At 0500 departs Truk for Balikpapan in convoy No. 7111 consisting only of NIPPON MARU escorted by destroyer HAYANAMI. At 1355 arrives at Palau still escorted by destroyer HAYANAMI. At 0900 departs Palau in convoy 2516 consisting of fast oilers NIPPON and KENYO MARUs and naval oiler IRO with destroyers HAYANAMI and WAKATAKE as escorts. At dawn, HAYANAMI is detached. At 1700, after taking on 10,200-tons of heavy oil and 2,000 drums of aviation fuel, NIPPON MARU departs Balikpapan for Palau at 1700 escorted by destroyers SHIMAKAZE and HAYANAMI and patrol boat No. 102 (ex-USS STEWART, DD-224) at the start of the journey. Departs Palau for Truk in convoy with oiler KENYO MARU, another oiler and a destroyer. NIPPON MARU is carrying 80 IJN Special Naval Landing Force (SNLF) troops and about 50 Army civilians. Joins destroyers SAZANAMI and AKEBONO that sortie from Rabaul. 180 miles S of Sorol Island. At about 1300, the convoy is sighted by LtCdr (later Rear Admiral) Norvell G. Ward's (USNA ’35) USS GUARDFISH (SS-217). Ward sets up on a destroyer, but is unable to shoot. SAZANAMI spots LtCdr (later Rear Admiral-Ret) James W. Blanchard's (USNA ’27) USS ALBACORE (SS-218) and makes for her at high speed. Blanchard fires four stern torpedoes at the charging destroyer. Two hit and sink SAZANAMI at 05-30N, 141-34E. Nearby, Ward's USS GUARDFISH takes a periscopic photograph of SAZANAMI sinking. AKEBONO attacks USS ALBACORE and drops 59 depth charges. While the destroyer is occupied with USS ALBACORE, Cdr (later Rear Admiral-Ret) Walter G. Ebert's (USNA ’30) USS SCAMP (SS-277) attacks NIPPON MARU. At 1256, Ebert gets hits with two of six torpedoes he fires in a submerged attack. One torpedo hits the aft engine room and one amidships. Fire breaks out and NIPPON MARU burns, then sinks in just two minutes at 05-02N, 140-50E. Of the 80 SNLF aboard, 27 are killed as are 16 crewmen including the CO, Captain Takehara. He is promoted Rear Admiral, posthumously. Removed from the Navy List under internal order No. 427. NIPPON MARU was also known as NIHON MARU by various sources. Data from an unconfirmed General Intelligence comment indicates NIPPON MARU may have been at Singapore on 30 Sep '43. Thanks for assistance goes to Sander Kingsepp of Estonia, Matthew Jones of Mississippi, USA, Gengoro Toda of Japan, Gilbert Casse of France and Allan Alsleben of Oregon. Photo Credit U.S. National Archives via Ron Wolford.